closed in the Ark and it began to rain? If so, that will be Nov. 29, 2013, Black Friday, the biggest shopping day of the year. > > I also lost my husband to Parkinson's in 2010. We will meet again!! That's for sure, and you can be together forever. I just happened to think of something I wanted to tell you. Just keep in mind that your Christian husband didn't actually die. He just left that earthly body. He has a celestial body like my husband had when he visited me. In Joh_11:26, Jesus said, "And whosoever liveth and believeth in me shall NEVER die." That is a strong statement by the Lord himself. HE KNOWS. Ed didn't die. He walked into the bedroom at a fast clip with an ear to ear grin on his face. He answered my questions, then walked through the wall. Is God one person or two? > > Did Jesus suffer in hell? 1Pe 3:18-20 says, "For Christ also hath once suffered for sins, the just for the unjust, that he might bring us to God, being put to death in the flesh, but quickened by the Spirit: 19 By which also he went and preached unto the spirits in prison; 20 Which sometime were disobedient, when once the longsuffering of God waited in the days of Noah, while the ark was a preparing, wherein few, that is, eight souls were saved by water." > > Is God one person or two? Isa 44:6-8 says, "Thus saith the LORD the King of Israel, and his redeemer the LORD of hosts; I AM THE FIRST, AND I AM THE LAST; AND BESIDE ME THERE IS NO GOD. 7 And who, as I, shall call, and shall declare it, and set it in order for me, since I appointed the ancient people? and the things that are coming, and shall come, let them shew unto them. 8 Fear ye not, neither be afraid: have not I told thee from that time, and have declared it? ye are even my witnesses. IS THERE A GOD BESIDE ME? YEA, THERE IS NO GOD; I KNOW NOT ANY." Isa_45:21-23 says, "...THERE IS NO GOD ELSE BESIDE ME; A JUST GOD AND A SAVIOUR; THERE IS NONE BESIDE ME." 22 LOOK UNTO ME, AND BE YE SAVED, ALL THE ENDS OF THE EARTH: FOR I AM GOD, AND THERE IS NONE ELSE." 23 I have sworn by myself, the word is gone out of my mouth in righteousness, and shall not return, That unto me every knee shall bow, every tongue shall swear." Isa_48:12 says, "Hearken unto me, O Jacob and Israel, my called; I AM HE; I AM THE FIRST, I ALSO AM THE LAST." Isa_48:16 says, "Come ye near unto me, hear ye this; I have not spoken in secret from the beginning; FROM THE TIME THAT IT WAS, THERE AM I, AND NOW THE LORD GOD, AND HIS SPIRIT, HATH SENT ME" (i.e., the Son of God). Isa_48:18 O that thou hadst hearkened to MY COMMANDMENTS! then had thy peace been as a river, and thy righteousness as the waves of the sea"
Rev 1:8 says, " I AM ALPHA AND OMEGA, THE BEGINNING AND THE ENDING, SAITH THE LORD, WHICH IS, AND WHICH WAS, AND WHICH IS TO COME, THE ALMIGHTY." Rev 22:13 says, "I AM ALPHA AND OMEGA, THE BEGINNING AND THE END, THE FIRST AND THE LAST." Pro_30:4 says, "Who hath ascended up into heaven, or descended? who hath gathered the wind in his fists? who hath bound the waters in a garment? who hath established all the ends of the earth? what is his name (YHWH), and what is his son's name (YHWH OF HOSTS, JESUS), if thou canst tell?" We have 7 comets in our sky. ISON, Lovejoy, Linear, Encke, Nebski, Borisov and Brewington. The number seven means completion. That seems significant right now, because of the approaching First-Trump Rapture. Some hope that Comet ISON will end up as spectacular as "The Magnificent Tail of Comet McNaught" was in 2007. That is the prettiest and most astonishing picture of a comet I ever saw. I can hardly stop looking at it. 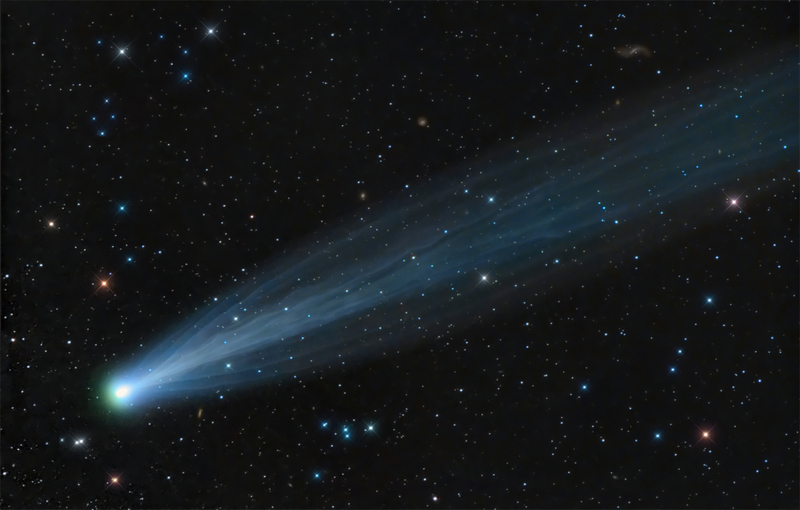 Comet ISON is moving at about 50 km/sec. It's speed will increase to 600+ km/sec when it passes the Sun on Nov. 28, Thanksgiving and Hanukkah. I hope ISON is a sign that Jesus, the SON OF GOD, is coming for his Bride. ISON was near Spica in the Constellation Virgo Nov. 17/18. It will be under Virgo's feet about Nov. 22 through Nov. 24 and at the Sun Nov. 28, 2013. It will be near Cepheus Jan. 14, near Cassiopia Jan. 15, and near Persius Jan. 31. In the picture, Cepheus, i.e., Christ as King of kings, is holding a piece of fabric aloft to show that he is a man of the cloth, a religious leader. Comet 154 P Brewington, seen Nov. 4, is now in PEGASUS, which in Greek means COMING QUICKLY, JOYFULLY. It represents Christ coming. In PEGASUS, the star MARKAB means RETURNING FROM AFAR. The star SCHEAT means HE WHO GOES AND RETURNS. The star ENIF means THE BRANCH, referring to Christ. JESUS IS THE "BRANCH OF THE LORD"
Isa_4:2 says, "In that day shall the BRANCH OF THE LORD be beautiful and glorious, and the fruit of the earth shall be excellent and comely for them that are escaped of Israel." JESUS IS THE "BRANCH OF RIGHTEOUSNESS"
Jer_33:15 says, "In those days, and at that time, will I cause the BRANCH OF RIGHTEOUSNESS to grow up unto David; and he shall execute judgment and righteousness in the land." Zec_3:8 Hear now, O Joshua the high priest, thou, and thy fellows that sit before thee: for they are men wondered at: for, behold, I will bring forth my servant the BRANCH." JESUS "SHALL BUILD THE TEMPLE OF THE LORD"
Zec_6:12 says, "And speak unto him, saying, Thus speaketh the LORD of hosts, saying, Behold the man whose name is The BRANCH; and he shall grow up out of his place, and he shall build the temple of the LORD". 1Co_3:16 Know ye not that ye are the temple of God, and that the Spirit of God dwelleth in you?" Hag 2:15,18,19 says, "And now, I pray you, consider (sum labab, take it to heart) from this day (Kislev 24) and upward (maal, upward, on high), from before a stone was laid upon a stone in the temple of the LORD:...Consider now from this day (Kislev 24) and UPWARD (maal, RISE UP, from alah, to ASCEND UP AT ONCE, i.e., TO BE RAPTURED), from the four and twentieth day of the ninth month, even from the day that the foundation (Jesus, 1 Co 3:11), of the LORD'S temple was laid (Kislev 24, Jesus' conception), consider it. 19 Is the seed (Jesus, Gen. 3:15) yet in the barn? (a saying, meaning is she pregnant?) yea (YES), as yet the VINE (Jesus), and the FIG TREE (Israel), and the POMEGRANATE (meaning the upright), and the OLIVE TREE (Israel with the believing Gentiles grafted in), hath not brought forth (NASA, ARISE, LIFT UP, CARRY AWAY, i.e., been Raptured): FROM (min, from, out of, after) THIS DAY (i.e., AFTER KISLEV 24, PROBABLY ON KISLEV 25, HANUKKAH/THANKSGIVING) WILL I BLESS YOU." THE RAPTURE COULD BE ON KISLEV 25, HANUKKAH/THANKSGIVING, NOV. 28 (28 means eternal life), OR KISLEV 26, Nov. 29 (29 means DEPARTURE). In the USA, the day after Thanksgiving is called BLACK FRIDAY, the biggest shopping day of the year. This year, Kislev 26 will be the 40th day after the Lord closed the door of the Ark on Cheshvan 17, because Cheshvan has 30 days this year). Since 29 means DEPARTURE, it seems significant that Israel became a nation by UN decree on Nov. 29, 1947. COMET ISON WILL ROUND THE SUN ON NOV. 28, AND TURN NORTH AT THE FOOT OF OPHIECHUS ON NOV. 29 at the foot of OphIECHUS, which stands for IESOUS, Jesus. Ophiechus has his foot on Scorpio, i.e., Satan, and is wrestling a snake, Satan, to keep him from obtaining the crown, Corona Borealis. The Rapture is something that Satan would like to prevent. If the Rapture takes place on Nov. 28/29, there will be lots of love and joy. No wonder the comet Lovejoy will be in the sky. In the northern sky, directly overhead, are the constellations Cepheus (which with the lines connected looks like a house) and Cassiopia (which looks like a "W"). Cepheus is Christ as the King of kings. Cassiopia is the Bride of Christ. Both are holding up pieces of cloth, meaning they are religious leaders. We call a minister a man of the cloth, showing that he is a religious leader. CEPHEUS, meaning THE BRANCH, wears his royal crown. His foot is on Polaris, the North Star. BETA CEPHEI (also called Alfirk) means "flock" and refers to a flock of sheep. Gamma Cephei, traditionally called Errai, Alrai, Er Rai or Errai, means "the shepherd". At Denderah, Cepheus was called PERKU HOR, THIS ONE COMETH TO RULE. The brightest star in Cepheus is ALDERAMIN, which means COMING QUICKLY AS IN A CIRCLE. It also means "the right arm." Jesus is the "arm of the LORD" in Isa 53:1, and he is coming quickly. AL PHIR, means THE REDEEMER. AL RAI, means HE WHO BRUISES OR BREAKS. CHEICUS means TO COME IN A CIRCLE, REGULUS means TREADING UNDERFOOT. Cepheus is the BRANCH, the REDEEMER who will COME QUICKLY AS IN A CIRCLE. THE HEAVENS REVOLVE AROUND HIM. Due to the precession of the equinoxes, CEPHEI will be the pole star around AD 4000. Keep in mind that ZODIAC/ZODI means THE WAY. The Lesser Sheepfold is under the feet of Cepheus. URSA MINOR was known to the ancients as the Lesser Sheepfold. Cepheus is the good shepherd. The good sheep in the Lesser Sheepfold know his name and follow him. We are the good sheep. He stretches out his scepter to Cassiopia, his Bride. In Cassiopia, the star SHEDAR means the freed. Caph means THE BRANCH. The throne belongs to THE BRANCH, and his freed bride is set upon it. In John 10:11, Jesus said, "I am the good shepherd: the good shepherd giveth his life for the sheep." In John 10:14 he said, "I am the good shepherd, and know my sheep, and am known of mine." Psa_95:7 says, "For he is our God; and we are the people of his pasture, and the sheep of his hand. To day if ye will hear his voice..."
Psa_100:3 says, "Know ye that the LORD he is God: it is he that hath made us, and not we ourselves; we are his people, and the sheep of his pasture." Ursa Major is the Greater Sheepfold. It represents the saints caught up in the last Rapture, the one that will take place on the Day of God's Wrath. Act 1:9,10 says, "And when he had spoken these things, while they beheld, he was taken up; and a cloud received him out of their sight. 10 And while they looked stedfastly toward heaven as he went up, behold, two men stood by them in white apparel;11 Which also said, Ye men of Galilee, why stand ye gazing up into heaven? this same Jesus, which is taken up from you into heaven, shall so come in like manner as ye have seen him go into heaven." Two comets are well named. Comet I SON will turn north on Nov. 29 at the foot of Ophiechus, which represents Jesus wrestling with the snake to keep him from getting the crown, Corona Borealis. If the First-Trump Rapture takes place on Nov. 28/29, there sure will be lots of Love joy. I want to stress here that having four comets in view simultaneously is a positively UNPRECEDENTED event. In fact, having two prominent comets visible in the same region of the sky is a relatively rare event, and having three comets appear at once is extremely rare. But there has NEVER been an incidence of four comets being visible in the sky at the same time ever in recorded history! As a result, I can confidently say that these four comets are a sure Sign that Yahshua is coming soon, and the Great Tribulation is about to begin, just as the Blood Moon Tetrad of 2014 through 2015 are heralding! NEW ASTEROID THAT 'BELCHES OUT DUST' DISCOVERED FRIDAY, NOVEMBER 8, 2013"
"'It' is P/2013 P5, which NASA described as an "unusually fuzzy-looking object" when it was spotted in August in our solar system's asteroid belt. "The Hubble Space Telescope then focused on it, photographing it first in early September and then again 13 days later. By then, it looked completely different -- as if it had done a 180-degree flip, NASA said. "The giant rock is about 1,400 feet wide and probably reaches surface temperatures of 1,500 degrees Fahrenheit. For that reason, NASA thinks it's made of rock and not ice, like a typical comet is." The show has already started for ISON, as an outburst from the comet on November 13-14 raised its brightness 10-fold. O.K. Some common sense---"stranger than in a century or more---half the number of sunspots---magnetic poles oddly out of sync"---something is making these effects on the sun. It is something unusual. It seems to me that a magnetic pull could cause these effects. Ison has just recently entered our solar system. It is moving with tremendous speed. If it is already causing these kinds of effects on our sun then look out. A sun caused EMP could begin untold havoc on the world. The 3rd seal had to do with money (the root of all evil). The 4th seal is a result of what happens when money is destroyed. So mankind destroys itself as Jesus releases the fourth beast with the forewarned evidence from Ison. > > Ison has just recently entered our solar system. It is moving with tremendous speed. If it is already causing these kinds of effects on our sun then look out. ISON is supposed to go around the Sun Nov. 28, then go north Nov. 29—if it doesn't disintegrate. I have a feeling it will survive perihelion and go north, because of the dramatic story that could tell. > > The 3rd seal had to do with money (the root of all evil). The 4th seal is a result of what happens when money is destroyed. So mankind destroys itself as Jesus releases the fourth beast with the forewarned evidence from Ison. I agree Jesus did not sin. But what hath that to do with Jesus not suffering hell. Sin was laid upon our Lord who knew no sin; and the wages of sin is death. We know God died (1 John 3 line 16) for sinners and all have sinned. p.s. If Jesus did not provide himself a lamb for a burnt offering as thou sayest, either his work is not finished or Abraham is a liar. Jonah said, "out of the belly of hell cried I", yet he was not in fire. He was in the belly of a whale. I put "OUT OF THE BELLY OF HELL" in caps when I quoted you below so you could find it easy. "so shall the Son of man be three days and three nights in the heart of the earth." Matthew 12:40. Read and digest Acts 2:31. Regarding Jesus, it says "NEITHER HIS FLESH DID SEE CORRUPTION." Here is the whole verse. Act 2:31 says, "He seeing this before spake of the resurrection of Christ, that his soul was not left in hell, NEITHER HIS FLESH DID SEE CORRUPTION." > > I agree Jesus did not sin. > > But what hath that to do with Jesus not suffering hell. Suffering in hell is punishment for the sin of not accepting Christ as one's own Saviour. Some people are stubborn, and say, "How can I accept something I can't see?" That is our test. We have to accept what we can't see. We accept electricity and gravity because of what they do. Why not Jesus? All things were created by him. We were created not being able to see God. If we could still obey God, he would be proved just in putting the fallen angels in prison. They could see God and failed their test. > > Sin was laid upon our Lord who knew no sin; and the wages of sin is death. > > We know God died (1 John 3 line 16) for sinners and all have sinned. > > is, eight souls were saved by water. The first reason is because most of the church has come to leave their first love. The church that began strong (a believing church), that in the process of time, has become apostate toward the doctrine of Christ, which substantiates His gospel, thus in His eyes, the majority of it has become an unbelieving church. And once the majority of the church becomes apostate toward His doctrine then it loses its savor, and is good for nothing, but to be trodden under foot of men (Matt. 5: 13). The angel told Daniel that the church would become this way in its time saying, "And in the latter time of their kingdom, when the transgressors have come to the full, a king of fierce countenance, and understanding dark sentences, shall stand up" (Dan. 8: 23). The Aramaic word for transgressors is pasha, which means to break away from just authority; to apostatize. Who was give just authority to go and make disciples of all nations; baptizing them...? It was the church, no doubt! Therefore the transgressors refer to the apostate church; and when it comes to the full (the majority), then a king of fierce countenance shall stand up (all this because the church would have lost its savor). "A falling away comes first"
"That man of sin be revealed, the son of perdition"
The Daniel 8: 23 verse and the 2 Thess. 2: 3 verse complement one another. It's my conviction that 2 Thess. 2: 6 is all about the believing church becoming apostate; that it was the believing church that was the restraining force in keeping that man of sin from being revealed, and that when the church becomes apostate, then that man of sin would be revealed, the son of perdition, and is the reason he is revealed when he is: because of exceeding sin: within and without the church. One of the purposes of that man of sin is to waste away, and to ultimately bring the nation in which he arises out of, to desolation. In 2 Thess. 2: 7 there is no doubt that the "mystery of iniquity" refers to the mystery of the shemitah (Deut. 15: 1-2), which Rabbi Jonathan Cahn writes about in his book The Harbinger (chapter 17). I also believe that where it says in verse 7, "until he is taken out of the way," that this is NOT referring to the Holy Spirit or the church or to Michael the archangel, but rather to the nation in which that man of sin arises out of, that when it is removed from power, then shall that Wicked be revealed (vs. 8). So, knowing that the church comes to the full in being apostate, then why would He Rapture a church where most have left their first love? And except for His grace and mercy and love for them He correct them (shortening of the days [kolazo]; Matt. 24: 22; Mark 13: 20), then no one would be saved? It's my conviction that the elect refers to those who believed in Christ, but were deceived into another gospel, which is not another, but a lie (Gal. 1: 6-7); thinking to be something they are not (Gal. 6: 3). Those elect who come to repentance via the Two Witnesses when the Holy Spirit is poured out again, the latter rain, which are from all nations, and kindreds, and people, and tongues, and that no man can number, will stand before the throne, who were martyred for their faith in Christ (Rev. 7: 9; 13-14). Therefore I believe the elect refer to these believers in Christ that were deceived, who came to repentance, and were martyred. Philadelphia: consists of Messianic Jews and Gentile Christians who came to Christ in the last days. Smyrna: consists of the 144, 000 Jews that come Christ in the latter times; being redeemed first by the church of Philadelphia (Rev. 14: 4). After these Two go forth in humility, sharing the doctrinal truth of His gospel to the elect, that after the elect are martyred, then these Two go forth and testify against an ungodly and disobedient world, in which when their testimony is finished, they are killed, and then 3 1/2 days later the Spirit of life enters into them. It's at this point in time I believe when He says, "Come up here," that it's at that moment in time those alive and remaining in Christ will be "caught up together [those alive w/ the Two Witnesses] with them [those that have previously died in Christ] in the clouds, to meet the Lord in the air" (1 Thess. 2: 17). After this, then comes His wrath upon all the ungodly [them that never knew God] and His disobedient children [them that refused to believe the truth of the gospel], in which He returns with His angels and all His saints, to set up His millennial kingdom. This is what I believe, as it was revealed to me in His word by Him. If we are honest with the condition of the church, it has come to the full in being apostate toward His doctrine, which substantiates His gospel, and teaches us that we must cease from doing those sins of the flesh in 1 Cor. 6: 9-10 and Gal. 5: 19-21, etc. Sadly, most of the church believes He continues to abide in them even in the midst of doing one of those sins of the flesh mentioned above. They come to this conclusion because of their misconceptions of Heb. 13: 5; 1 Jn. 1: 8, which causes them to misinterpret scripture, as well as they do with the rest of scripture to their own destruction. > > "A falling away comes first"
> > "That man of sin be revealed, the son of perdition"
That "falling away" should be "departing", as in the Geneva Bible quoted below. Eight Bibles older than the KJV had departing. The KJV was the first to mistranslate "he apostacia". Many modern versions have followed the KJV. The "departing first" is the First-Trump Rapture. 3 "Let no man deceive you by any means: for that day (i.e., the Day of the Lord) shall not come, except there come a DEPARTING first, and that that man of sin be disclosed (i.e., because he won't go in the Rapture), even the son of perdition. 4 Which is an adversary, and exalteth himself against all that is called God, or that is worshipped: so that he doth sit as God in the Temple of God, showing himself that he is God. 5 Remember ye not, that when I was yet with you, I told you these things? 7 For the mystery of iniquity doth already work: only he (i.e., the Holy Spirit) which now withholdeth, shall let (i.e., withhold) till he be taken out of the way (i.e., when the First-Trump Rapture takes place).